I've been writing the first draft of a book to honor home births and was in the midst of writing about a lesson I learned from Pam England's book, Birthing from Within. Then I thought why not write a blog post about it? So here I am writing this up. As you know, art is powerful beyond measure. Art stirs our imaginations and go beyond three dimensions. How art touches each individual is deeper than sight, sound, taste, touch, etc. Yes, I appreciate art. However, I appreciate art that comes from within even more. Each of us has art within us that is only up to us to bring forth. Yes, each of us has many masterpieces to actualize into being. How sacred that within space is in each of us. That within space is beyond three dimensions. That within space is exactly what art can touch that nothing else seems to be able to touch. So I appreciate art that I can draw. I also appreciate learning from this process and applying it to other processes within my life. Now that I have successfully given birth to three children through vaginal birth, I am certain I can apply the lessons I have learned to my writing career. So the first thing I want to do is to create a piece of art for my writing career. So I send this intention out to my Dream Fairies and await the perfect vision to arise. On another note, I was contacted by one of my fellow co-authors about formatting a chapter from the New Moms, New Families book I edited in 2012, so that the pdf file could be distributed to other new families. What a joy to go through the information again and be able to contribute to the welfare of a new mother! Looking back, I can't believe how much work I put into putting the anthology together and how fast everything fell into place to make it exist! Enjoying a mellow Father's Day weekend, I am once again immensely grateful for all the co-authors who contributed their wisdom to the anthology. I hope that one day, more families will benefit from our collective knowledge! My third and final celebration goes to the existence of cloud servers, particularly document organizers such as Microsoft OneNote. I may be an absolute beginner in using such technology, but at least now I can use something else besides my Google Calendar to input notes that inspire me all in one day. With a document organizer app, instead of filing everything into one day, I can now input notes in specific and separate tabs/files of info! Yay! Being a mother of three young ones, I really appreciate the constructive feedback I get from other adults who care about my child as much as I do. I really appreciate the people who are passionate about their jobs and passionate about the people whose lives they touch. I am humbled by their generosity and willingness to work with parents. One other thing my child gave me on that last day of pre-K before summer break began was a piece of paper about the summer reading program. He handed the paper to me, saying that the teachers told him that it was for me. Looking at the brochure, I am also grateful for the amount of fun educational programming the local libraries invest upon to keep children entertained while school is out. My kids also had their first exposure to the game Uno. I have not played that game in over twenty years! To be honest, it's close to thirty years ago. I couldn't believe that I had forgotten so many rules! Then again, I haven't read the rules that came in the box. Why read the small print when I could rely upon the reporting of a seven-year-old to reinforce the rules? Over the weekend, I was also very pleased to take a rare trip to a Chinese language bookstore and have my eldest child pick up a VCD, pictured at left. Although the store insisted upon no refunds or exchanges and I had no clue if I could play the VCD on my computer, I decided to purchase it. Well, impulse buys rarely work out! I went online to find a picture of this VCD set and found the list price (shipping included) at about half the price I paid for at the store! I could say that I made a mistake not to check resources online. However, I think the trip was a good thing, though, because I exposed all of my kids to the bookstore environment--one that has a lot of Chinese language books, games, CDs, VCDs, and more. For now, I am looking forward to the day when I complete the current work I am writing on home births. 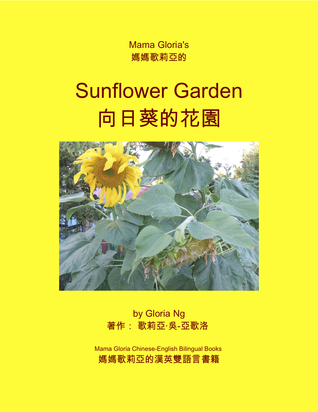 Check out my Goodreads exclusive giveaway for a signed paperback copy of my bestselling ebook, Mama Gloria's Sunflower Garden. Click below to enter! Giveaway ends September 08, 2014.